This elegant holy card (or, prayer card) is accented with golden highlights, making it ever so much more special than other paper holy cards. 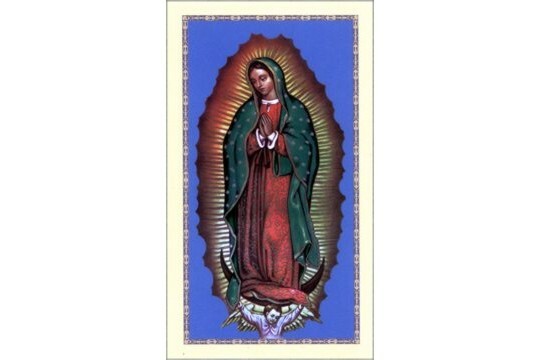 It illuminates a traditional image of Our Lady of Guadalupe. As the patron of the Americas, Guadalupe (as many call her) is a much revered and beloved saint. 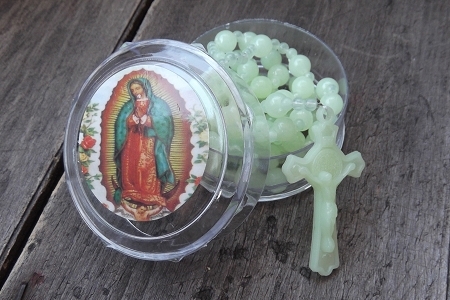 The image is vibrant and would make a wonderful part of your retablo, ofrenda or a great backdrop to a nicho project. Each set includes five standard-sized cards, all the same. On the back of each card is a Novena to Our Lady of Guadalupe in English.